October is breast cancer awareness month and, as a breast cancer survivor, I could not let another day go by without blogging about breast cancer. Women are more afraid of getting breast cancer than heart disease. Our risk for heart disease is 10X higher than breast cancer. Breast cancer did not go away and all of us women are at some risk for getting breast cancer in our lifetime. The good news is that fewer women die from breast cancer today than years ago and a healthy lifestyle may decrease some of the risk. 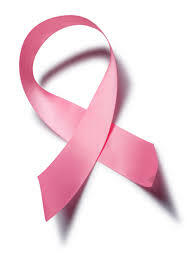 The reason women are surviving breast cancer is because of early detection and going for routine mammograms. Doing a self breast exam once a month and getting familiar with how your breasts look and feel is an important way to establish good breast health. The next step in establishing good breast health is to learn if your breasts are dense. A dense breast has less fat and more tissue and is more common in younger women. Detecting tumors on mammograms is harder with dense breasts and your risk for breast cancer is greater. To find out if your breasts are dense ask the radiologist and if the answer is yes talk to your doctor about adding MRI and/or ultra sound at check-up time. Research shows that regular exercise of 1 ¼ to 2 ½ hours a week lowered the risk of breast cancer by 18%. Women who have more fat produce more estrogen thus increasing their breast cancer risk. Increased risk is seen in women who have gained 20 – 30 pounds since high school. Along with the research on regular exercise is also research on a diet rich in fruits and vegetables, eliminating processed foods, and limiting red meat and alcohol (one drink per day) will also lower your risk for breast cancer. Other ways to lower your risk are: know your family history, including your father’s side, Consider breast feeding. Breast feeding lowers the amount of estrogen your body produces over your lifetime and is excellent for the baby too. Although we all may not escape breast cancer, living a healthy lifestyle, being aware of our bodies, and getting regular check-ups will give us a fighting chance against breast cancer.